Where can I find coffee shop near me? We’ve made finding a local cafe simple. The map above is all you need and it inserts all the results for you. Make sure you have your GPS turned on if you’re using a mobile device. To see how to turn on your GPS, click here if you have an iPhone and here if you have an Android device. Who actually invented the Coffee Shop? We can consider ourselves lucky because now we have great choice of big coffee shop chains, boutique espresso bars and even bikini barista espresso stands! Of Course it wasn’t always like this. One of the first to encounter coffee houses or ‘Cahue-hane’ as they were called in Smyrna (Turkey) in 1650 ,was French scholar Jean de Thevenot who called them ‘cabarets publics de cahue’. Coffee drinking was brought to London by Daniel Edwards and Thomas Hodges who entertained friends in private houses ,but the ‘novelty’ was ‘drawing too much company to him’ and coffee prices were going up ,so they decided to open public coffee house which was unusual in those times to say the least . The first coffee house was opened near Holborn ,London as early as 1652 and no later than 1654 by Pasqua Rosee sponsored servant of Edwards and Hodges. This was risky business considering that the regulations were very strict and that coffee drinking was almost unknown to the wider audience. With time coffee houses developed as places where people can freely communicate as well as enjoy a cup of coffee. They even changed London’s 17th Century social structure because different coffee houses were visited by certain public , for example some were visited by politicians ,some attracted scholars or city professionals. Fast forward to the beginning of the Second World War and coffee almost but disappeared form the European markets. Common substitutes were roasted chicory, beans and acorns which by the way were still used in some countries long after the end of the war. By that time the demand that came from the growing postwar economies was much larger than the production and the domestic markets in Europe and America were offering mostly substitutes and instant coffee. Nestle for example in 1953 along with their ‘Nescafe’ was branding and searching market for ‘Ricory’ – blend between chicory and soluble coffee. Several coffee bars were opened in Soho,London in the summer of 1953 ,following the establishment of ‘Gaggia Experimental Coffee Bar’ or ‘Riservato’ by Riservato Partners Ltd branded as the Italian Caffè. 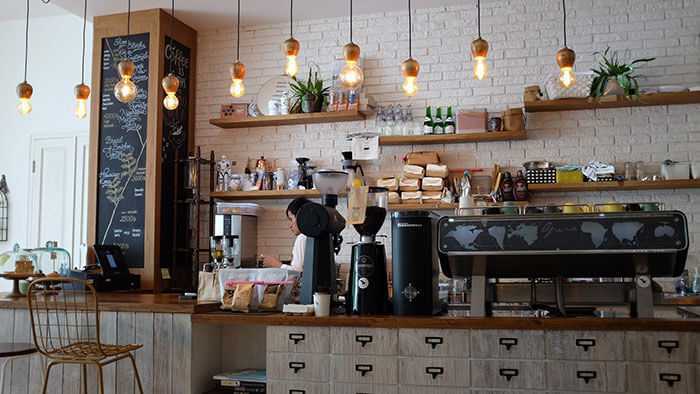 Those were the first places that introduced the modern espresso machines with polished metal parts and the modern coffee shop style with art hanging on the decorative brick walls. One of my favorite things to do is find new local coffee shops. The ones that really stand out are the shops that are unique and have a great atmosphere. While the franchise places try to emulate the ambiance of a genuine cafe, though they do a decent job, it’s hard to get that true feeling in a place like Starbucks or even Caribou Coffee (a place I really love). When looking for a local cafe, it might be hard to determine this type character that comes with a genuine local shop, so you may just have to find one on the map above that isn’t a chain and visit it yourself! Last, but definitely not least, you must find locations offering have high-quality coffee! This, of course, comes down to your own tastes, but you can always tell when a shop takes the time to carefully craft a delicious java beverage. Coffee types which carry fruity aroma can be characterized as Enzymatic -they carry the origin of the plant when the coffee was first picked. This types of coffee will often have berries or citrus fruit flavor. Coffee from Columbia and other Latin America countries will most likely remind you of sweet fruit or melon ,on the other hand coffee with African origin will have a tangy taste. Sugar Browning – this is the type of coffee which taste will be similar to cookies , pastries ,cocoa or even nuts. Dry Distillation Coffee – that typically means the coffee was actually “burned” when roasted. This process brings up scents like clove ,tobacco or wood. Fresh roasted coffee is like a treasure that needs to be found. The best explorers use clues, like recommendations from friends and family, as well as reviews, cupping events, and their favorite coffee stores to find the road to the treasure. Coffee is something I could live without, but I can’t imagine my life without it! I love the vast array of tastes from the different beans, the smell and the sound of the grinder.